FOR ALL MONTRÉAL SCHOOL BOARDS, THE GRADUATION AND QUALIFICATION RATE AFTER 7 YEARS FOR STUDENTS IN THE 2008 COHORT WAS 78.1% IN 2014-2015. This graduation rate was slightly lower than the provincial one of 78.8%. There are signifi cant discrepancies in the graduation rates of Montréal’s various school boards: 85% for the schools in the CSMB, 89.4% in the EMSB, 87.8% in the Lester-B.-Pearson S-B, and 69.5% in the CSDM (Figure 4.1). The graduation rates after 7 years in Laval and the Montérégie are lower than those observed in Montréal: 76.3 % in Laval and 73.4 % in the Montérégie, for the 2008 cohort. The graduation and qualifi cation rates after 6 years are lower: 74.8% for the 2008 cohort for all of Quebec and 73% for Montréal. After 5 years, the graduation rates decline to 66% in Quebec and 61% in Montréal. For comparison purposes, in 2015, the graduation rate for Ontario and for the schools of the Toronto District School Board was 85%. The gap between girls’ and boys’ graduation rates is trending downward but remains significant at around 10 percentage points. IN QUEBEC IN 2013-2014, THERE WERE NEARLY ONE MILLION STUDENTS ENROLLED AT THE PRESCHOOL, PRIMARY OR SECONDARY LEVELS IN THE PROVINCE’S 3,000 EDUCATIONAL ESTABLISHMENTS. Of these students, 23% attended an establishment located in Montréal, 19% were in the Montérégie region and 5% were in Laval. In the early 1970s, there were over 400,000 students attending primary or secondary schools on the island of Montréal. This illustrates the significant demographic changes that have occurred in the last 40 years. The decrease in the number of enrolled students between 1971 and 2013 was greater in Montréal than for the province of Quebec as a whole: 46% vs. 39%. In Montréal in 2012–2013, the school drop out rate for high school students in the public SYSTEM was 20.8%, an improvement of 4.2 percentage points over 2008–2009. NOTE: The rate reported for all of Quebec is an overall rate that includes both public and private schools. However, the rates by school board include only public schools because the method used to calculate graduation rates cannot be applied to private schools due to their small size. The rate includes the secondary school graduation rate for that period and the qualification rate for students in the Work-Oriented Training Path. 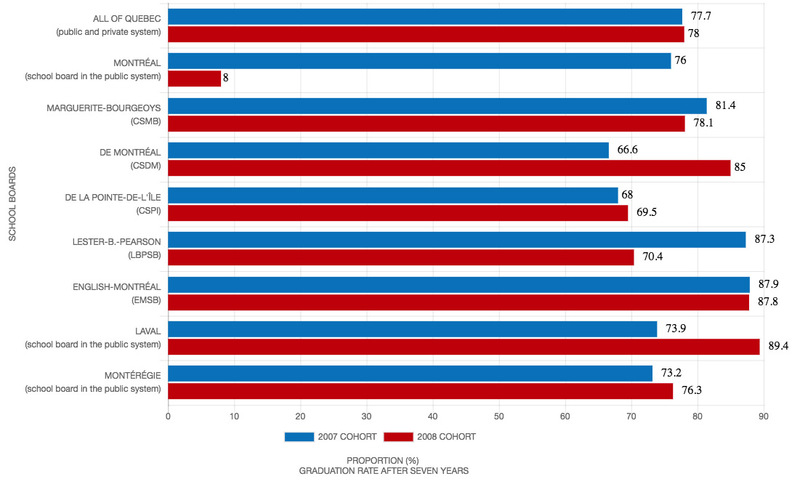 The data in this table shows the progression of the 2007 and 2008 student cohorts up to their graduation in 2013–2014 and 2014–2015. SOURCE: Ministère de l’Éducation et de l’Enseignement supérieur (MEES), 2016 (originally compiled by the Infocentre de santé publique du Québec using the Charlemagne system). IN MONTRÉAL IN 2012–2013, THE SCHOOL DROPOUT RATE FOR HIGH SCHOOL STUDENTS IN THE PUBLIC SYSTEM WAS 20.8%, AN IMPROVEMENT OF 4.2 PERCENTAGE POINTS OVER 2008–2009. The dropout rate in Montréal is higher than the province-wide rate of 17.8%. The annual dropout rates for the Laval and Montérégie region sare lower than the Montréal and provincial averages: 16.8% in Laval and 16.6% in Montérégie. The dropout rate for young Montrealers in the public school system was 24.1% for boys and 17.4% for girls. For Quebec overall, the rates were 21.9% for boys and 13.9% for girls. This shows that dropping out of school is more prevalent among girls in Montréal than in the rest of the province. In fact, in some Montréal schools, the dropout rate is higher for girls than for boys. IN MONTRÉAL IN 2015, MORE THAN 60% OF STUDENTS ENROLLED IN FRENCH- AND ENGLISH-LANGUAGE SCHOOLS WERE FROM FIRST- OR SECOND-GENERATION IMMIGRANT FAMILIES. 46% of first- and second-generation students will finish their studies within the expected timeframe compared to 57% among third-generation students. 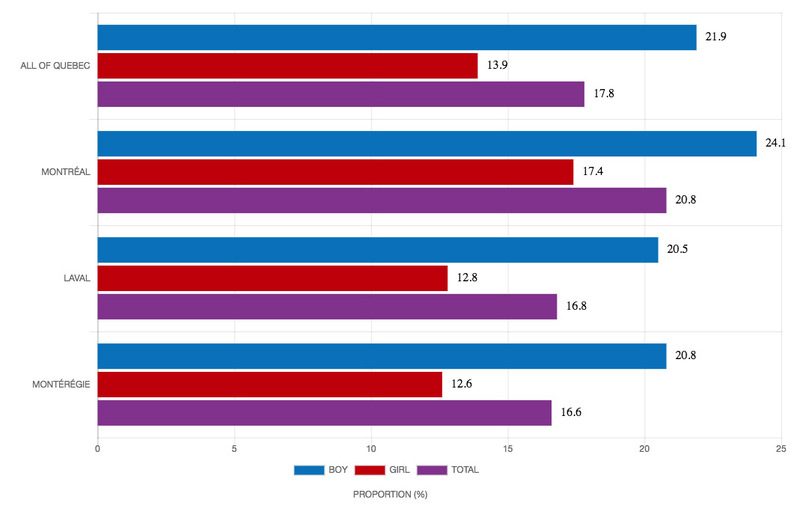 In Montréal in 2014–2015, students with handicaps, social maladjustments or learning disabilities (also known under the French initialism EHDAA) accounted for 19.4% of the school population, which is lower than for the regions of Laval (22.8%), and Montérégie (19.6%) and for Quebec overall (20%). There were proportionally more boys than girls considered to have handicaps, social maladjustments or learning disabilities. than that of students who are not. In Quebec the number of reduced-contribution program spots at educational childcare centres increased from 196,618 in 2006 to 232,034 spots on March 31, 2016. The Montréal region had about 28% of all reduced-contribution spots in March 2017, followed by the Montérégie region, with 19% of spots. Laval had 6% of spots. In 2017, nearly 70% of spots in Quebec's unsubsidized childcare centres were located in Montréal, Laval or Montérégie. In 2015 in Quebec, the monthly cost of a childcare centre spot for children aged five and under was $174. Childcare centre costs are considerably lower in Quebec than in other Canadian cities, especially Toronto ($1,128). In Montréal in 2012, 29% of children in kindergarten were considered vulnerable in at least one developmental area. This is higher than the percentage of 26% observed for Quebec overall. Proportionally, more boys, more children born outside Canada and more children from very economically disadvantaged areas were considered vulnerable in at least one developmental area. 41% read or told them stories (48% for Montréal). A 2015 SURVEY OF 1,000 PARENTS OF CHILDREN AGED 4–17 CONDUCTED BY CEFRIO SUGGESTS THAT, IN QUEBEC, THE VAST MAJORITY OF PRIMARY AND SECONDARY STUDENTS HAVE ACCESS TO AT LEAST ONE DIGITAL DEVICE AT HOME. About 8 out of 10 students have either a smartphone (81 %), a laptop computer (79 %) or an e-tablet (76 %) at their disposal. The parents of school-aged children estimate that their children use the Internet an average of 10 hours a week. About 2 of those hours are for school work and 8 hours are for non-school-related activities. SOURCE: Lavoie, A. et C. Fontaine (2016). Mieux connaître la parentalité au Québec. Un portrait à partir de l’Enquête québécoise sur l’expérience des parents d’enfants de 0 à 5 ans. 2015. Quebec, Institut de la statistique du Québec. Beaudoin, J., C. Bourget, G. Mallette-Vanier, S. Racine, G. Ducharme et A. Lavoie (2016). Portrait des compétences numériques parentales. Résultats d’une enquête menée auprès de parents d’enfants d’âge scolaire. Quebec, CEFRIO.